Hello beauties, I hope you all had a great weekend. It has been sunny these last 2 days and I can already feel Spring coming. As Spring and Summer are my favourite seasons, I am getting really excited. Today I thought I would do more of a lifestyle post and share some of my recent favourite TV series, as I find these posts quite interesting. It is always great to find a new TV series to watch on days when you do not feel like doing anything, or having a series marathon with friends & family. This is a mystery-thriller TV series about the lives of a teenage group of best friends (Hannah Marin, Spencer Hastings, Aria Montgomery, Emily Fields and Alison DiLaurentis) after one of them disappears. A year after her disappearance, the girls begin getting messages from a mysterious figure called A. A knows everything about them, all their secrets and is able to monitor their movements. Who is A? Nobody knows. This TV series possesses the ability to keep you on your edge and is very interesting. So if you haven't already seen it, you definitely have to. White collar is a crime drama TV series about a conman, forger & thief named Neal Caffrey. Neal Caffrey escapes from prison with months left on a 3 year sentence in order to find the love of his life Kate but is caught once again by Peter Burke. After returning to prison, Neal Caffrey gets the opportunity to be a consultant to the FBI (instead of sitting in jail) and help Peter Burke catch other white collar criminals by using his expertise in all things things related to theft, forgery etc. There are so many interesting moments in this series, and if you like crime series, you will definitely like this one. According to imbd, this series is classified under Mysery, Sci-Fi and Drama. This is a story about a former reporter named Martin Bohm who is trying to raise his son Jake on his own after the tragic death of his wife in the World Trade Center during the September 11 attacks. Jake has never spoken a word and his father never understood why he keeps writing down numbers in patterns in his notebook, until Martin realises that his son can predict things before they happen. The series circles around their lives as Martin tries to help Jake prevent bad things from happening. Girls and money is always a great theme for a series or movie, so seeing this I knew instantly I had to watch it. 2 Broke Girls is about the lives of 2 girls: Caroline Channing who was born rich and had everything until her father was caught operating a ponzi scheme which made her penniless; and Max Black who was raised in a poor family. Caroline and Max work together at a dinner and have a dream of opening their own cupcake business. Such a funny series. Max's humour may not be for everyone, but I personally think all the ladies reading should go check it out if you haven't. This is the most recent series I watched and I loved every bit of it. I am really sad there aren't more episodes yet and cannot wait to see what is next. This series can be found under the categories Drama, Horror & Mystery. It tells the story of the happenings in Chester's Mill after a transparent indestructible dome landed on the town and trapped everyone inside. There is no communication to the outside world except the radio station which occasionally gets signals, and will limited resources, the town tries to survive as a small group of people tries to figure out what the dome is and if they can bring it down. If you haven't seen any of these, you should definitely take a moment to watch at least 1 episode to see if you like it because personally I love all of them. 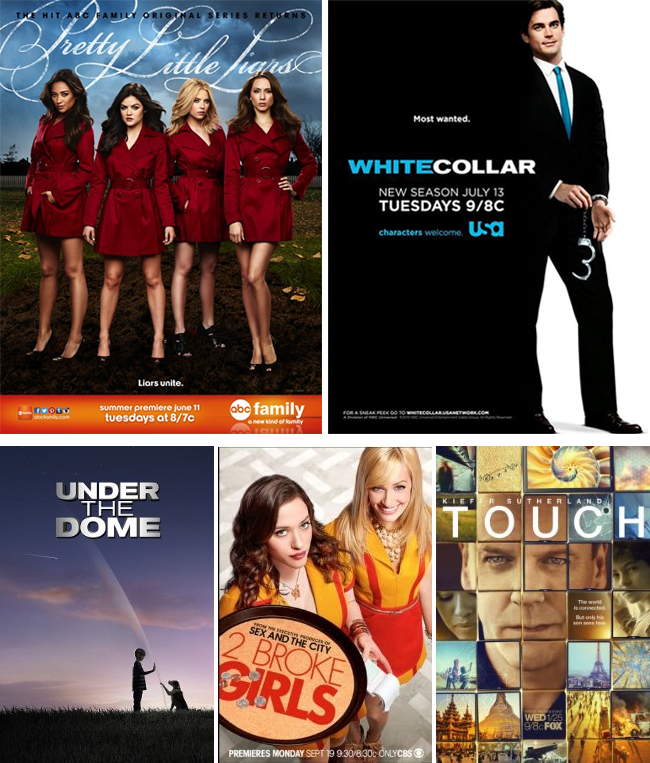 What do you think about these TV series if you have seen them? Any suggestions on what else to watch? I love PLL and Under The dome!